What were you doing last year when GSE wasn't racing? Darrell Healey was still paying Dave Parkes, Pete Bancewicz and myself, so it was paid leave, and it was the hardest thing in the world. We knew we were going to stop in 2003 but at the time we didn't know if we were going to re-establish the team for 2005. Having said that, Darrell kept the race truck, the workshop and hospitality unit. If he had sold everything and let us go then it would have been more unlikely we would return because the investment to come back would have been massive. Is BSB a different place now to what it was when GSE left it in 2000? When we went to the World Superbikes we noticed the organisers and promoters were proactively helping teams, whereas in BSB we didn't feel as welcome, put it that way. It was hard work to get what we needed to do the job. That was something I noticed when we came back this year - the organisers and promoters are far more positive now. Is there anything BSB needs to do to work at to keep it at the level it's at now? Over 10 years ago the teams were told we needed to up our game. Not having a decent image was not helping the sport. The teams and manufacturers have upped their game to the point that you're now sitting in a World Superbike level of hospitality, but the circuits haven't invested. Some are still the same now as they were 10 years ago. We can't continue to have £300,000 of hospitality unit parked in a field. What Jonathan Palmer's done is fantastic - for years we were told this can't happen, that can't happen, then he comes in and it happens overnight. The MCRCB is doing a fantastic job, Jonathan Palmer's doing a fantastic job. The others need to follow. GSE has brought a new sponsor to the sport: Airwaves. Are they happy? Definitely. Of course they wanted results and lots of media coverage but we couldn't guarantee it because we didn't know how successful we'd be. But they were open-minded, and in fact we're having a pretty good season. Do you get lots of free gum? We get plenty of free gum. Our jaws are a lot stronger than they were last year. You've got a reputation as a hard taskmaster - if your riders do what you say do you get the best out of them? Well, it appears that way. Having been in the game for quite some time now I'm pretty confident that I know what pieces of the jigsaw you need to make it complete and successful. I think I'm hard but fair. Were you looking forward to working with James Haydon, and was it hard to drop him for Gregorio once the season had begun? I've wanted to work with James for several years, mainly because off the motorcycle he is a total professional. That's one of the pieces of the jigsaw you need. There are so many good riders who are useless off it from a media point of view, and James already had that. When James had his accident we were struggling to find a replacement and it was only by sheer luck we found Greg was available. Then he had two good results at Brands, so from then on it was potentially a difficult situation. The actual decision to drop James for Greg was easy commercially, but emotionally it was very difficult. You've worked with Neil Hodgson, Troy Bayliss and James Toseland, who all went on to be world champions. Is it a conscious thing to nurture talent then let it move on? Emotionally you never want to let a rider go, but we're not going to stand in their way. They've all gone on to the factory team and won a world championship - from that point of view we're delighted, but we want to be the guys that take them to the world championship and win. One day it'll happen. A few riders are characters to say the least. Are there any you'd like to see what you can do with, or would you rather not try? There are certain riders I believe I would fail with, which I think is very diplomatic of me. I won't name them, but I would say that the riders who want to be individuals and not team players are the ones who will never get a job with me - and they know who they are. What's next for you and the team? 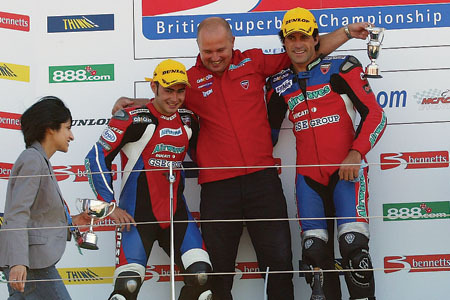 We've got unfinished business in World Superbikes because we haven't won it. That's GSE's ambition. But then if we don't win BSB this year we're going to feel we've got unfinished business here as well. We're ready and able to do one or the other, and we can succeed at both.